The M50x may be more expensive than the outgoing M50 (which is now under £100) but it's worth it. Improves on the M50's great design. Pricier than the model it replaces. "We'd happily mix with the M50x, which we would have shied away from on the old model"
The only true physical change is the M50x's new removable cable. Cups still spin 180 degrees on the horizontal and vertical on a sturdy hinge for shoulder mounting single-cup DJ styling. Comparing M50x to M40x it's clear that the larger driver (45mm over 40mm) delivers better bass but it's the increased clarity and mid definition that surprised us. And comparing M50x to the old M50 the difference hits home as soon as you tax them with dense Electronic tracks. M50x goes deeper and feels clearer and more airy, with the M50 sounding more like the M40x. We'd happily mix with the M50x, which we would have shied away from on the old model. The M50x may be more expensive than the outgoing M50 (which is now under £100) but it's worth it. 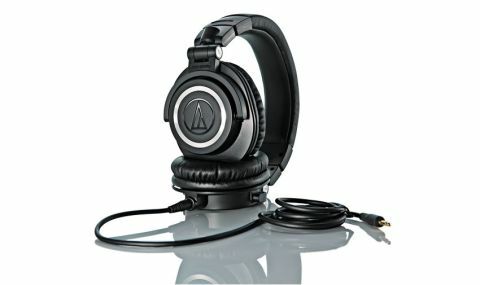 And if £100 is your limit try the M40x or bag an old M50.